In issue 21/22 of Jump we said goodbye to Bakuman. In issue 23 Genson! Kodai Seibutsu-shi Pakki ended due to cancellation. 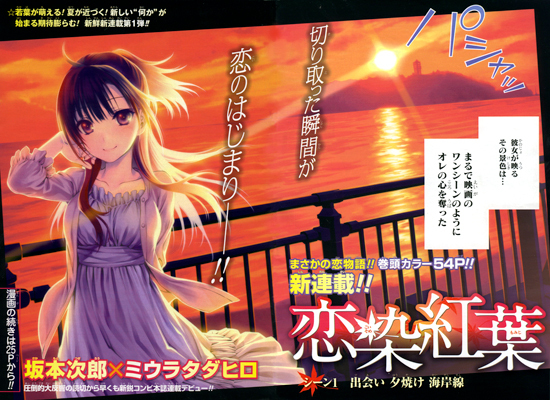 Also in the same issue new series Koisome Momiji started. "There is a saying that if you find a japanese maple leaf with eight tips you will find everlasting love. A popular high school actress is now making a film about that legend at the main character's high school, who in turn has a crush on her. One day after school he runs into her and helps her escape from some pursuing staff members. It turns out that since she started acting right after middle school she hasn't had any experience with love and that is hurting the production of the movie. So to get some experience with love she invites him out on a date." This new series is a romance manga in a shonen magazine, so it must either be very interesting/ engaging enough for the readers or have a lot of "fan service". A shonen orientated romance mangas are probably the most difficult to create, therefore it could flop very quickly. It will have to compete with the other romance series in Jump, Pajamas Na Kanojo by Kosuke Hamada.